(SINGAPORE, 30 October 2018) – Sony today announced that it marks five years of full frame mirrorless technology and being the number one[i] mirrorless camera brand in Singapore for the fourth consecutive year in 2018. To celebrate this milestone, Sony is hosting its first ever Digital Imaging Carnival at the Plaza Singapura Atrium from 30 October to 4 November, 2018. Titled Sony Alpha Universe, visitors will be able to learn more about mirrorless camera technology in an interactive setting and how it is revolutionising the photography industry. The event will also feature an incredible lineup of immersive installations, exciting activities and contests. Sony revolutionised the camera market when it debuted the world’s first full-frame mirrorless cameras – the α7 and α7R – back in 2013. Building on the success of its game-changing predecessors, Sony has continued to churn out impressive shooters and expand its line of legacy lenses in its α7-series of full-frame mirrorless cameras in the past five years. To date, Sony boasts an extensive line-up of nine full-frame mirrorless cameras and 29 native full-frame lenses that continue to impress professional photographers and enthusiasts alike. Setting the standard for mirrorless cameras, Sony continues to be the number one sensor maker in the industry and offers numerous noteworthy features such as the two SD card slot design, longer battery life for extended shooting and effective pricing. “Sony was the first to market with a full frame mirrorless camera back in 2013 with the launch of the Sony α7 and α7R cameras. And despite being fully invested in another brand, I took the plunge and started using the α7R for work. Five years later, I am absolutely certain that mirrorless is the future with a smaller and more portable camera that can do everything a DSLR can do AND more. The ability to adapt almost any legacy lens to the system is a big plus, and for my work as an architectural photographer working with manual focus lenses, nailing focus has never been easier with the high resolution electronic viewfinder that allows you to zoom in instantaneously for focus confirmation. I could never use a traditional DSLR anymore.” – Darren Soh, Professional Architectural Photographer. “I switched over from a DSLR system to a full frame mirrorless system about five years ago and have not regretted the decision to do so. The switch was surprisingly easy and with the recent introduction of the α9, it has made shooting extremely fun. Eye AF coupled with an extremely fast AF makes this camera a wedding and event photographer’s dream camera. There are no other cameras I would swap it for.” – Kelvin Koh, Professional Wedding Photographer, owner of Lightedpixels Photography. The α7 III was released early this year in February, packed with newly developed back-illuminated full-frame CMOS sensor and other advanced imaging innovations, high-speed response, ease of operation, and reliable durability that are ready for various shooting needs. Launched in 2017, the α9 offers many impressive capabilities that are simply not possible with a modern digital SLR camera including high-speed, blackout-free continuous shooting[ii] at up to 20fps[iii], 60 AF/AE tracking calculations per second[iv], a maximum shutter speed of up to 1/32,000 second[v] and much more. 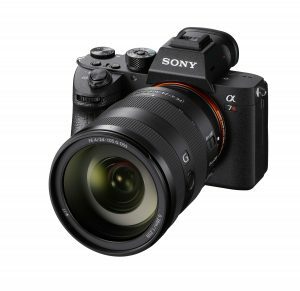 Also launched in 2017, the α7R III combines a high-resolution 42.4 MP[vi] back-illuminated Exmor R CMOS image sensor with impressive shooting speeds at up to 10 fps[vii] with full AF/AE tracking, as well as beautiful image and 4K[viii] video quality, wide 15-stop[ix] dynamic range, high sensitivity with noise reduction of almost a full stop[x] and more. [ii] Electronic shutter mode. At apertures smaller than F11 (F-numbers higher than F11), focus will not track the subject and focus points will be fixed from the first frame. Display updating will be slower at slow shutter speeds. [iii] “Hi” continuous shooting mode. The maximum frame rate will depend on the shooting mode and lens used. Visit Sony’s support web page for lens compatibility information. [iv] As of 19 April, 2017. [v] 1/32000 shutter speed is available only in the S and M modes. The highest shutter speed in all other modes is 1/16000. [vii] Up to 10 fps in continuous “Hi+” mode, and up to 8 fps in continuous “Hi” mode. Maximum fps will depend on camera settings. [viii] A Class 10 or higher SDHC/SDXC memory card is required for XAVC S format movie recording. UHS speed class 3 or higher is required for 100 Mbps recording. [ix] Sony test conditions for still images. [x] Compared to the α7R II, according to Sony testing.